BIMCO issued a security advisory on 13 June 2016, wishing to clarify some points on the Industry Releasable Piracy Threat Assessment off Somalia releasedto the Shipping Industry in March 2016 by EUNAVFOR – Combined Maritime Forces (CMF) and NATO. As BIMCO mentions, although the industry reduced the High Risk Area on 1 Dec 2015 and although there have been no successful attacks for some time, the threat assessment does not indicate that Piracy off the coast of Somalia has been eliminated and will not start again. On the contrary, the assessment stresses that many of the conditions ashore that were present at the start and peak of Somali piracy still remain, allowing pirates to act with impunity in certain areas of Somalia. BIMCO adds that whilst the pirate leaders remain in Somalia and large numbers of younger pirates are about to be released from prison, there is no room for complacency of any sort. Piracy is suppressed -but not eliminated. The threat has not completely gone away. A risk of resurgence of Somali Piracy exists. Illegal fishing off Somalia has re-emerged as a problem that could lead again to piracy. 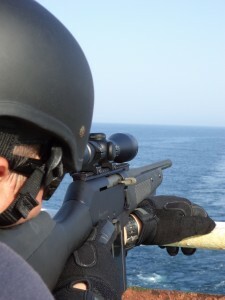 The intent, capability and opportunity for Somali pirates to attack merchant ships remains. One of the most likely areas that could be focused upon is east of the HRA eastern boundary of 65⁰ East, or at least close to it. It is unlikely pirates will operate closer to shore, where they know risks remain, in particular military presence. Within the HRA voyage risk assessments remain absolutely essential and given the threat the best mitigations remain speed and freeboard. Additionally, ships transiting the Madagascar Gap route should carry out the most thorough risk assessments and implement the guidance provided in BMP4. CSOs and Masters employing PMSCs should pay attention to all guidance available. Tagged advisory, BIMCO, CMF, EUNAVFOR, guidance, HRA, Indian Ocean, NATO, piracy, risk assessment, threat.